In the midst of the worship services and the parties and the shopping and everything that has to get done this time of year, in the words of John Wesley, there is one thing needful for my family to feel prepared for Christmas – we must watch Christmas Vacation. We got that out of the way early this year, making time to laugh at Clark and Cousin Eddie shortly after we put the finishing touches on our tree, complete with our Moose Egg Nog ornament. You remember, of course, in the climax of the movie when Clark realizes that the Christmas bonus he needs is not coming and instead he will receive the gift that keeps giving the whole year round – the Jelly of the Month Club – he announces that if anyone is still looking for a last minute Christmas gift for him, well he has an idea. And we all know how quick everything goes downhill from there. Because I don’t want you to risk going to jail after tying a bow around your family member’s profit-hoarding boss, here is a fun list of 10 books that I loved this year. The list is a little earlier than usual, so there’s plenty of time to fight the White Walkers at Barnes and Noble or click and ship from Amazon so Santa’s Jolly Little Elves can get you your book before you make it home from the Christmas Eve service at church. 2. Being Christian, Rowan Williams: Rowan Williams is one of my favorite writers on the faith. Brilliant and faithful and engaged in the work of a diverse and divided church, I’m not sure there is a more important writer and thinker on the church right now. Being Christian is an insightful yet accessible look at the practices God gives us that form our identity: Bible, Prayer, Baptism, and Communion. Bonus: it is currently going for less than nine bucks on Amazon. 3. The Church of Mercy, Pope Francis: I’ve got a serious crush on Pope Francis and this book is a collection of essays and sermons he’s delivered since becoming Pope. Catholic or not, Christian or not, there’s plenty of grace and mercy in this book for anyone, which as we all know, is what our divided and broken world needs now more than ever. If you are looking for a morning devotional to begin the new year, you could do a lot worse than this. 4. The Vacationers, Emma Straub: Finally, something for non-church leader dorks. I picked this up in the airport on my way home from our vacation to Boston. It’s a beach read about a dysfunctional family. But unlike some other similar buzzy books (like Seating Arrangements for example; if you must read this, you’ll have to find it on your own. ), The Vacationers combines its searing insight into broken people and difficult relationships with hope and grace. Each of the characters has plenty of issues, but like the best of us, their cracks make them likable and they become easy to root for. 5. We Live in Water, Jess Walter: Jess Walter is my favorite fiction writer hands down. If you haven’t read Beautiful Ruins, stop what you are doing, and run to go buy it. Seriously. Now. We Live in Water is a collection of short stories that he released in 2013. They are sad and tragic and beautiful and touching. He is an immensely talented and insightful writer. You won’t be disappointed. I also read Out of Sorts, her latest book. It’s good too, but Jesus Feminist is the one that will stick with me. 7. 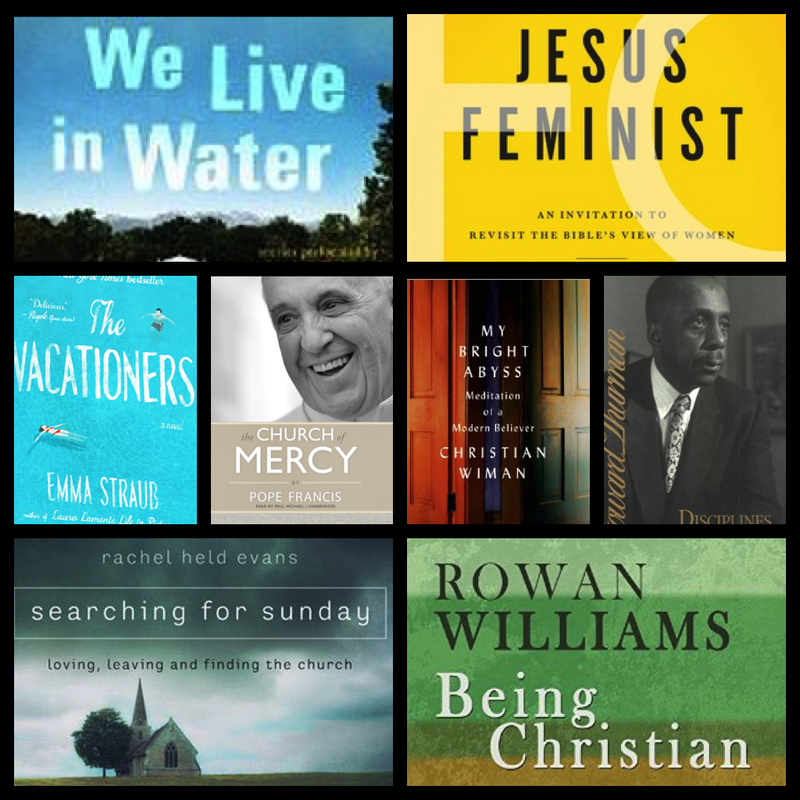 Searching For Sunday, Rachel Held Evans: You can’t be a pastor of millennials, evangelical and progressive and not wrestle with Rachel Held Evans. Particularly when she lives in your state. At times her blog doesn’t speak to the questions I am asking, but I loved her book. It is at its best when it deals with her own faith struggles and about the power and tradition of the sacraments to anchor us in faith even when we aren’t sure where to go. I don’t know anyone who won’t find parts of the book to disagree with, but this was a really good book from a maturing and emerging thought leader. 8. Brother of the More Famous Jack, Barbara Trapido: Whenever I am in Nashville I make sure to stop at Ann Patchett’s bookstore, Parnassus. Some of the best books I’ve read in the last couple of years have come from Ann’s recommendations. This is one of the best. The book is about a young woman and her love for two brothers, but its really about mentors and the intellectual life and discovering the kind of life you need to live and the way that search evolves over the course of your life Trapido’s writing reminds me of Nick Hornby, one of my favorite writers. 9. Disciplines of the Spirit, Howard Thurman: I discovered Thurman in college and some of the people I looked up to the most in seminary were enamored with him. The section on commitment is a must read and has a lot to say to the church and its leaders both about individual spiritual formation and about how we engage those outside the church on issues related to justice. This is one I’ll go back to. 10. NYPD Red, James Patterson: Obviously, not the book if you want an intellectual dig. I’ve been getting into mysteries and I read the first three books of this series in about a week. Fun and fast-paced, Tolstoy they ain’t, but they can be a great distraction from bad NFL Football. #Eagles – enough about that. If you want to order Book 2 and Book 3, well, you can do that too. Disunity in Christ, Christena Cleveland: I’m challenging myself to read a more diverse author set, particularly as it relates to the church. This will be a challenging read, but one I know that I need to dig into. Career of Evil, Robert Galbraith: Read and loved the first two in the series and am really hoping Santa shows up with this for my stocking. Will be the first book I read in 2016. Big Magic, Elizabeth Gilbert: Liz Gilbert on creativity is a must read. It’s been on the shelf for a while and it will be an early read for 2016. Where Jesus Prayed, Danielle Shroyer: I discovered Danielle Shroyer through a Textweek link to her blog. She is winsome and insightful. I’m really looking forward to getting into her book on the geography of the Lord’s Prayer. Love May Fail, Matthew Quick: Quick writes characters who are quirky and a little bit odd – descriptions that have been used of me once or twice – as well as anyone. (Silver Linings Playbook is his best known book). He tells stories that enable us to see the best in anyone, no matter how odd or different they might be. The Tsar of Love and Techno, Anthony Marra: Another Ann Patchett recommendation. His last book was one of my favorites of 2014 and I haven’t heard anything that will lower expectations for the new one.